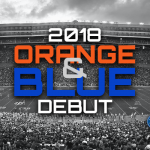 Just a few months into a new era, the Florida Gators will take the field Saturday afternoon for the 2018 Orange & Blue Debut, a spring football game that head coach Dan Mullen hopes will be a springboard for Florida football this season and beyond. Here’s what you need to know ahead of the Orange & Blue Debut. Florida held a roster draft on Friday, so this will not be a traditional first-team vs. second-team game. Check out the top 20 players on each roster below, along with links to full rosters. 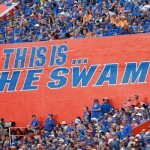 Who will be the Gators’ starting quarterback? There are larger, more general offensive issues at hand, but ultimately, everything starts and stops with the signal caller. And Florida, through 14 spring practices, does not appear to have settled on a starter. 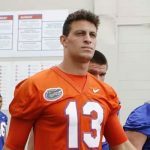 Redshirt sophomore Feleipe Franks enters as the incumbent, and though he has reportedly flashed during spring practice, he has done nothing to pull away. This has opened the door for classmate Kyle Trask, particularly since freshman Emory Jones has seemingly been unable to push Franks the way many expected he would immediately off the bat. Franks’ performances in spring games are well-known by this point, so it will be interesting to see what kind of effort he can put together on Saturday. Mullen claims there has not been a ton of separation at this juncture, though he also cautions that he has not been seeking it at this time. “There’s a long time before we have to make any decisions or play a game, so I’m not really concerned about that right now — unless I need to see something, whether in a leadership role or something else.” Mullen did mention, however, that the quarterbacks are handling many of the tough situations well, while it’s the easy ones they are taking for granted. He cited Franks as putting up the best numbers at the last scrimmage. What’s up with the specialists? This may not seem like a top-two issue to some, but the Gators will be replacing an All-American caliber punter and kicker this season. Couple that with an increased focus on special teams — following an organization that seemed not to care one iota about it — and one should be curious to see what the third phase of the game looks like this spring. Granted, you will not be able to see the special teams perform as the other units, but its contributions to the effort on Saturday should not be overlooked. Who are the playmakers? It’s legitimate to wonder who’s atop the running back depth chart with sophomore Malik Davis injured, redshirt junior Jordan Scarlett returned from suspension and junior Lamical Perine back for his third season. Similarly, with more importance being placed on tight ends, it is a wonder who will step up out of that group. And of course, there are the wide receviers to consider. Junior Tyrie Cleveland has missed most of spring, sophomore transfer Trevon Grimes has impressed but may not be eligible for Week 1, redshirt senior Dre Massey is still returning from injury, and redshirt junior transfer Van Jefferson awaits word on whether he will be eligible after leaving Ole Miss. The rest of the receiving crops has not been overly impressive, though it is clear sophomore Kadarius Toney is planning to make a major impact one way or another. Is the linebacking situation ready to shake out? While the defensive line and secondary once again look like they are going to be solid in 2018, concern remains regarding a linebacking unit that was under-manned last season. Junior David Reese is a no-brainer in the middle, but there remain a variety of issues with junior Vosean JosephKylan Johnson, redshirt junior Rayshad Jackson and redshirt freshman Ventrell Miller. Saturday’s spring game could go a long way to deciding who actually lines up next to Reese by the time action starts next fall. Will the offensive line be fixed? Finally? Which freshman will stand out? Aside from Jones being given the opportunity to take snaps — most of which will come in the second half — there’s a number of first-year players set to debut in the spring game. Freshmen running backs Dameon Pierce and Iverson Clement will have a chance to show out as part of a loaded backfield. Redshirt freshman defensive end Zachary Carter did not see action a year ago but could join the linebackers as an impact younger, as could first-year defensive back Trey Dean, who may find a way to see playing time right off the bat next season. Will anyone on the defense flash? It’s always tough on the defense in spring games considering they are unable to sack the passer and often play relatively limited schemes on the back end. Despite all of that, Florida has seen defenders show out in the past. The Gators’ secondary could plausibly wreak havoc on the young quarterbacks, which could be an encouraging — or downright awful — sign for the upcoming season, depending which side of the coin you sit on entering Saturday. » Two boosters will serve as celebrity coaches for the game. They will have an opportunity to call the type of plays, while the assistants on each team will actually decide the specific plays.